Product prices and availability are accurate as of 2019-04-20 23:32:39 EDT and are subject to change. Any price and availability information displayed on http://www.amazon.com/ at the time of purchase will apply to the purchase of this product. Eating and drinking healthy has just been made simpler and tastier thanks to the Hamilton Beach Stay or Go Blender. 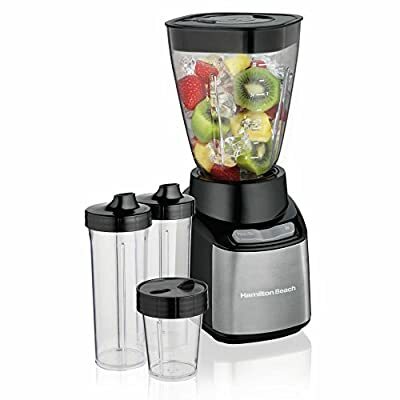 With its 650 watt peak-power motor and pulse action for precision control, this blender will quickly become a staple in your kitchen and an integral part of your morning routine. Whether you're using the included 32 oz. jar with lid to create a delicious homemade salsa perfect for your next party or one of the two included 16 oz. travel cups to transport a healthy fruit smoothie, this blender will soon take the place of other appliances. The blender also comes with an 8 oz. grinding cup with shaker lid that can be used to finely chop herbs or perhaps grind some fresh coffee beans. All of the included containers are made of shatterproof Tritan and are lightweight, dishwasher safe, clear, and BPA-free, making clean up simple and ensuring that none of your food is contaminated by chemicals. Try this multi-tasking blender and you'll quickly find all manner of ingenious uses for it. Dimensions: 5.5 W x 6.25 D x 13.5 H in.. Peak wattage of 650. Features pulse action for precision. Dishwasher safe containers. Comes with 32 oz. jar with lid. Comes with 8 oz. grinding cup with shaker lid. Comes with 2 16 oz. travel cups with lids.